If you’ve been to Tuscany, you know that one word can sum up the experience: magic. 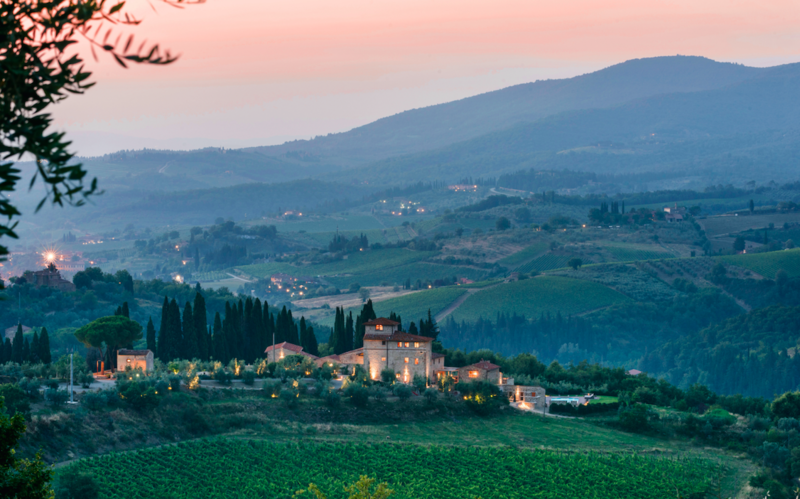 Whether you’ve visited the spectacular Old World city of Florence, ventured off the beaten path to a best-kept-secret provincial hamlet, or vineyard-hopped to soak in the region’s namesake wines, you know no Tuscan experience is ordinary. For luxury travelers, there’s good and then there’s the best. This summer, Social Life sought out the most exclusive properties for the private, elite traveler, and our, um, research turned up two options for exclusivity and opulence. Tucked away, but impossible to miss, Vitigliano Tuscan Relais is one of the most exclusive country estates in Tuscany, and is within the former Roman hamlet of Vitigliano. The property, which dates to 1085 (and is the former home of the renowned Verrazano family) has a second-to-none location in the Chianti region, halfway between Florence and Siena, with a unique hilltop setting that offers a breathtaking, unobstructed 360 degree vista. A local said it best: “Somehow, one feels closer to God here than in any other place of the world.” We couldn’t agree more. And, like your visit to a confessional, privacy is key: Vitigliano Tuscan Relais opens its doors to only 14 guests at a time. Perhaps it’s this level of attention that has garnered the property accolades, such as the 2016 Hideaway of the Year Worldwide, by Hideaways; 2106 Best Luxury Country Hotel Worldwide, by World Luxury Hotel Awards; and the New York Times was prompted to declare it a “European Top Destination,” in 2015. The location within a location is a veritable Eden surrounded by tranquil olive groves and oak forests, and landscaping that includes a chapel forecourt, a patio, separate terraces for sunrise and sunset, a yoga plateau, and, last but certainly not least, a regal pool with sensational daybeds. Vitigliano’s buildings are works of art, having recently undergone state-of-the-art renovations. While our advice is to do your best to enjoy this jewel as a duo, it is also well appointed for an event, whether a week away with besties or a high-class destination wedding with the one. 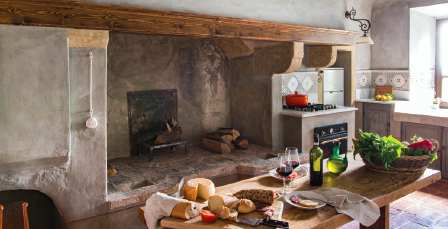 At Vitigliano, it’s in the details: Don’t miss the parquet flooring handcrafted from old wine barrels. These red wine stains are here to stay . . . and welcome. Each lavish suite features a picture-book view and luxurious appointments, including an open fireplace or bio-ethanol fireplace, local fabrics designed by Tricia Guild and Kenzo, and antique Persian rugs from the owner-family’s own priceless collection. Exposed natural stone walls and Serena stone edging help maintain an inviting climate. Our favorite? Suite Torre, which spans two stories in the Tower Villa. Migrate to the spa for an exquisite experience. From treatments to pools to fitness, there is something for everyone. This is Italy, so food and wine are essential to any experience. You won’t want to leave Vitigliano. From a gourmet breakfast to a four-course dinner, each meal is lovingly crafted from local, sustainable ingredients. Do not miss a tasting. The owners boast exclusive relationships with two blockbusters: Tommaso Cavalli, the son of the fashion designer Roberto Cavalli, and Laura Brunelli, the wife of the deceased Gianni Brunelli and the founder and owner of the famous Osteria Le Logge restaurant in Siena as well as the Brunello vineyard in Montalcino. Just as lavish, and some might argue more so, Borgo Pignano is the very definition of distinctive. 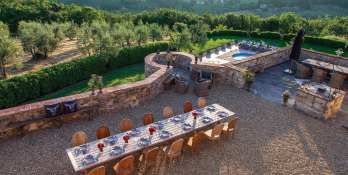 Just a short drive from the storied villages of Volterra and San Gimignano, and within easy reach of Florence, Siena, and the vineyards of Chianti, Borgo Pignano sits in the center of a bucolic 750-acre historic and organic estate. Centered around a magnificent, luxury 18th-century villa, the meticulously restored and privately owned Borgo, with its many options for lodging, offers both hospitality, gracious elegance, and some of most commanding views in Tuscany, stretching to the Mediterranean. 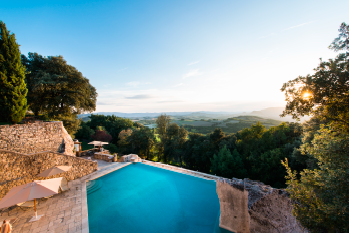 While some guests to Borgo Pignano will be seduced by the serenity of the estate and stay put for swimming in the infinity pool, soaking up Tuscan sun (and wine), painting or reading, or strolling among the orchards, gardens, and woodland paths, those with wanderlust will be right at home, too. Activities like yoga, horseback riding, biking, or wine tasting can all be launched from this paradise. A new and luxurious spa and wellness center features a trained herbalist who uses local flowers, herbs, plant extracts, oils, and honeys to promote a sense of well-being and relaxation. Borgo Pignano has a number of rooms in the main house; while we recommend the deliciously private La Canonica, a 13th-century former rectory with three bedrooms, any room will charm and pamper you. 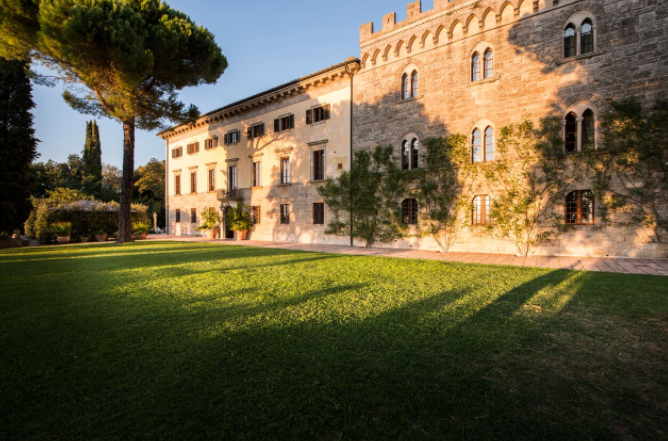 For something a tad smaller than La Canonica, go with The Music Room, one of the villa’s largest rooms, with high ceilings and Gothic-style windows overlooking the sweeping landscape. This spacious luxury suite features a four-poster bed, private sitting area, working fireplace, and grand piano. the estate’s natural lakes. La Piccionaia is more standard, sleeping four, but no less charming. It contains a first-floor living and dining room, fully equipped kitchen, and bathroom. The second floor has a large en-suite master bedroom with a queen-sized bed, a loft with tatamis, a single bedroom, and a charming pocket balcony. You will want to eat at either Villa Pignano Restaurant, Restaurant Al Fresco, or Kitchen Garden. Clean is the operative word, with many foodstuffs gathered from the property’s large vegetable garden and organic farm. From the flour they grind to sensational, organic honey from onsite beehives to Pignano’s free-range pigs and hens, each homegrown ingredient is chosen when at its most delicious. From lazy breakfasts to gourmet dinners to any number of activities, at Pignano you will enjoy an elegant and inspired setting.